The Barrister welcomes citizens at Boyertown's Borough Hall. 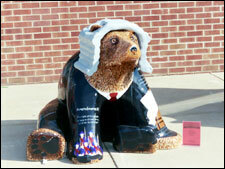 “The Bear-ister” Barrister (Lawyer) Bear is ready for court: complete with powdered wig and black robe. 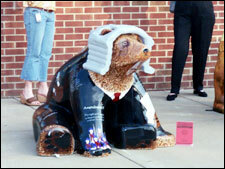 “The Bear-ister” represents a collaborative artistic and educational effort among 5 Boyertown law offices, four students and their art instructor Thomas Dareneau, and social studies classes at Boyertown High School. Of all our shared bears, “Barry” is my favorite. He’s adorable, of course. And I’m not alone in my fondness for him. Folks really like his wig and admire the many symbols of the Bill of Rights covering his body. But “Barry’s” looks are not the reason he is my favorite; more important is his ability to showcase the trifold mission of our Bear Fever project. Bear Fever’s mission is to create community cohesiveness, promote the arts, and provide career development opportunities for students. “Barry” inspired a true sense of community spirit among many participants in the project. For example, “Barry” is sponsored by 5 different local law firms. Whenever we mentioned this collaboration, folks often expressed some surprise—cynical as they are—that lawyers could “get together” on anything! Yet getting together on the sponsorship end was not the only point of collaboration for these gentlemen. When Charles Haddad assumed leadership in the design and fashioning of the bear, he was eager that students have a part not only in the art part of the project but also in developing the theme. He was also eager that he and his fellow attorneys have an opportunity to work with students, instructing them in notable points of law and the history of our country. Mr. Haddad offered, along with several of his colleagues, to visit several American History social studies classes at Boyertown High School to brainstorm possible themes for the imagery of the bear in order to create a bear that represented some of the core tenets of his revered profession. From these assorted sessions, a group of talented artistic students and Mr. Dareneau chose the symbols and wording carefully to complete a bear that represented the Bill of Rights. On the DC/DVD versions of the Bear Fever Walking Tour Mr. Haddad explains each of the symbols on the bear and their significance. Throughout the project, Mr. Haddad and Attorney Charles Fryer met with the students and their teacher Thomas Dareneau providing ideas and suggestions. Occasionally I’d hear “the lawyers are coming” and see Mr. Haddad, Mr. Fryer or Attorney Kenneth Nyce admiring the student art work in the lobby or visiting their bear. Their interest in the art and education of BASH students inspired all of us! “Barry” has inspired out-of-towners, too. One of my students came to me after our Arts Expo inquiring on behalf of her uncle, an attorney in Philadelphia, whether “Barry” was for sale. And while he isn’t leaving Boyertown, Mr. Dareneau would be happy to create a twin! Perhaps someday there will be a “Larry”? “Garry?” “Harry?” or “Carrie” Bear. Bear Fever is catching! And, remember, we’re not looking for a cure. In preparation for the collaboration among the sponsors, several of my students met with members of 3 of the law firms. Interestingly, each firm has its own “signature style.” The firm of Jeffrey C. Karver, Craig S. Boyd, and Jeffrey R. Boyd was the first firm we visited; Amanda Cappelletti showed her initiative by making a “cold call” to the firm in the middle of the 2004 Sidewalk Sale and secured Bear Fever’s first official appointment. The Karver, Boyd and Boyd office is beautiful with an air of tradition, wealth, and authority. A huge cherry desk, lush carpet, fine paintings by local artists are among the featured decorations. Visiting Kennth Nyce’s office feels like going home for advice from a dear friend. We were instantly comfortable and relaxed among Mr. Nyce’s display of autographed photographs of former presidents. His support for Bear Fever and our mission was warm and sincere, and his subsequent phone call offering his and Attorney Thomas Leidy’s backing for a “lawyer bear” inspired us to encourage other attorneys to participate. Visiting Attorney Charles Fryer’s office allowed Christy Pierce a chance to explain the history of the project and its benefits to our community and to students. Mr. Fryer admits that at first the Bear Fever project seemed “far out,” but by the time we presented the project to the Boyertown Community Library several weeks later, he was “on board,” enthused, and has remained an avid promoter. Attorney Charles Haddad had only to be invited to join the “team” to enlist his financial support. A “special kind of man,” among sponsors, Mr. Haddad holds the singular distinction of arranging his own celebration of the project and his finished bear by hosting a luncheon on his lawn for his fellow attorneys, the students, and the teachers involved in the project. He’s a classy guy.